(February 8, 2016 – Toronto, Canada) – Leading producer and distributor Portfolio Entertainment and U.K-based Giggle Media are pleased to announce a development deal with Corus Entertainment’s TELETOON for a new comedy animation series, Invasion of the MooFaLoo! The kids 6-11 co-production comes hot on the heels of Portfolio-produced Freaktown, an upcoming series commissioned by TELETOON. Invasion of the MooFaLoo! 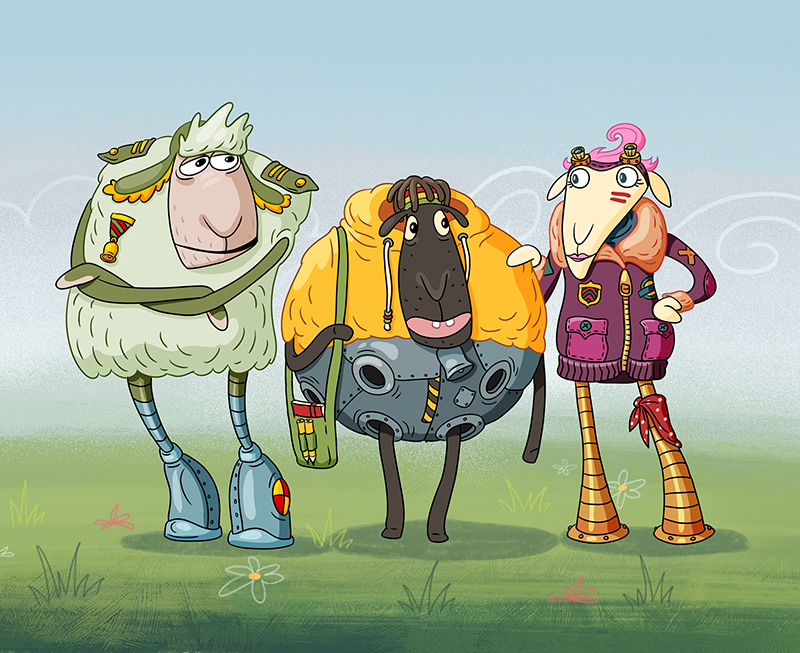 (26 x 11’), created by Steve Garratt, follows three genetically-modified, rocket-powered sheep – Fluffy, Byron and Telisa – as they fight to protect the world from the MooFaloo, a race of alien monk cows who conquer planets with their duck-shaped battleships. Portfolio Entertainment produces and distributes kids, factual and unscripted entertainment to television and digital media content providers worldwide. With two decades of industry experience, the company has a vibrant, creative culture and an entrepreneurial edge. Portfolio’s most notable projects include the celebrated The Cat in the Hat Knows A Lot About That!, DOKI, based on the iconic mascot of Discovery Kids Latin America, and Freaktown, launching on TELETOON in 2016. The company recently launched Portfolio Animation, a creative-driven animation studio staffed with top-tier talent and cutting-edge technology. Portfolio’s international distribution division represents a diverse catalogue of programming and has earned a reputation for superior content, diligence and drive. Portfolio was founded by Lisa Olfman and Joy Rosen and is based in Toronto, Canada. Giggle Media is part of The Giggle Group Ltd (www.thegigglegroup.co.uk). Giggle Media are an IP development company that specializes in scripted comedy for children and adults. Developing ideas in both animation and live-action, focusing on using humour and wit to explore the power of the imagination, bringing people together and putting a smile on their faces. The team in Bristol, U.K have many years of experience in designing and developing projects for the stage and screen. Giggle Media are currently co-developing 3 IP’s; two of which are in Canada and one is a U.K based co-production. 2016 is set to be a massive year for team Giggle as they bring more ideas to market and work with our Portfolio partners to get Invasion of the MooFaloo! launched. TELETOON is a multi-platform brand that brings kids and families the best in animated and animation-related entertainment with two nationwide specialty television channels – TELETOON and TÉLÉTOON. TELETOON is owned by Canadian-based media and entertainment company Corus Entertainment Inc. For more information, please visit teletoon.com and corusent.com.